iI 25 2015 il Golf della Montecchia ha ospitato il seminario Junior coaching per i campioni del futuro: l'esperienza di Vision 54, presentato da MGA in collaborazione con Federica Dassù. Vsion 54 è una delle Top10 Academy d'America guidata dalle professioniste Pia Nillson & Lynn Mariott, specializzate in mental coaching e allenatrici di moltissimi giocatori del Tour. Il seminario è stato incentrato sui Mental Skills che possono aiutare i giovani giocatori al di là della tecnica. "Pia and Lynn are dynamic, passionate and very astute about the game of golf. Golfers always attempt to improve at the game through technique and equipment alone. What make Pia and Lynn so unique in instruction is that their emphasis is playing better golf with an effective game plan. How to practice properly as well improving skill sets that are synonymous with lower scores. There ideas have helped me in my coaching of tour players. Apply their principles and you to will improve where it matters most; your score." — Sean Foley, coach of several PGA Tour players. "I love Lynn and Pia because they understand and teach the game in all of its breadth. They are great coaches who work with the things that are important to all golfers as we try to score. There is more to golf than swinging, and Play Your Best Golf Now deals with it. You cannot go wrong in following VISION54." — Dave Pelz, Dave Pelz Scoring Game Schools. Pia Nilsson and Lynn Marriott have revolutionized modern golf coaching worldwide. Learn and apply the unique performance and scoring drills and skills outlined in this book. You'll play better golf and have more fun. — Henry Brunton, Canadian National Team coach. I have known Pia Nilsson and Lynn Marriott for many years. Their passion for the game is second to none. The VISION54 approach is far more than just pure golf technique, it allows an individual to unlock their true potential by opening their mind and believing anything is possible to achieve. Golf games and more importantly, the game of life, benefit through their teachings." — David Leadbetter, David Leadbetter Golf Academy. Lynn and Pia have created a variety of effective ways to rid golfers of the interference that restricts on-course performance. The bonus is that these techniques also help you reach your full potential in life, too. Simply put, they are among the most influential coaches in the world today. You will only get better incorporating their ideas." — Mike Bender, 2009 PGA of America Teacher of the Year. You can have the greatest golf swing in the world, but you might not be able to break 80. Lynn and Pia get it. They understand there is much more to peak performance than just ball striking. This wonderful game has many pieces and they do a marvelous job of putting those pieces together for your best performance on the golf course." — Randy Smith, PGA Head Golf Professional at Royal Oaks C.C. Dallas Texas, 2002 PGA Teacher of the Year. Lynn and Pia's reputation for helping golfers improve is well deserved. Play Your Best Golf Now is another example of their understanding of both the nature of golf and human nature. It is filled with insights that any golfer, professional or amateur, will find useful." — Michael Hebron, PGA Master Professional and 1991 PGA Teacher of the Year. Pia and Lynn are two of golf's brightest thinkers and hardest workers. They never stop trying to improve on their past success, a trait of great coaches. They have helped countless golfers lower their scores and enjoy the game. If you follow their advice you can do the same. I heartily recommend you apply what you read. You won't regret it." — Martin Hall, 2008 PGA Teacher of the Year. There are a lot of distractions surrounding tournament golf. Lynn and Pia do a great job teaching their students how to focus on game days." — Stan Utley, coach of many PGA Tour players. Pia, Lynn and I have shared quite a few clients over the years, some of them the top ranked players in the world. I have seen their results first hand and can say with the utmost confidence that this book will help you achieve whatever goals you might have in this great game of golf." — Kevin Smeltz , Director of training and certification worldwide, David Leadbetter Golf Academy. What Lynn and Pia are doing in golf is really not that special. They just have that skill to take what has been made very complicated and turn it into something really simple. In today's world that is obviously completely unique and probably why they have come to revolutionize golf coaching and so many players' approach to performing on the course. I suggest you read this book quickly and ideally before you waste another four hours on the golf course with the wrong approach! "— Peter Mattsson, Director of Coaching, English Golf Union. Pia and Lynn provide valuable information for players or coaches seeking to become the best they can be. They break down the complexity of performance in golf into the 'need to know' essentials" — David Colclough, Head of Member Education for the British PGA. Lynn and Pia have positively influenced my playing and coaching by providing me relevant educational experiences in areas that I had not previously thought of. If you want to improve your golf game or coaching do yourself a favor and attend their programs and read their books." — Rudy Duran, PGA Life Member and first golf coach of Tiger Woods. The VISION54 concept has given me all the tools I needed for successful coaching. Pia and Lynn have inspired me to coach each person as a human being, as well as a player or fellow coach." — Walle Danewid, former head coach, Swedish National Teams. These two ladies have gotten a head start on golf's final frontier. They get past the swing minutiae and help their players play better golf. They are the best!" — Chuck Cook, Golf Digest Top-50 teacher, 1996 PGA Teacher of the Year. 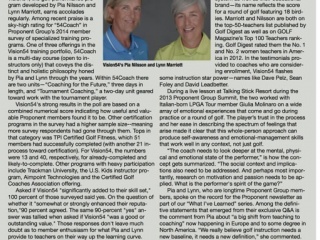 Pia Nilsson and Lynn Marriott rank among the most accomplished golf teachers in the world. Their record of producing star players and helping other teachers to do so as well is impressive. If you want to improve your game read this book...NOW!" — Dr. Gary Wiren, PGA Hall of Fame. Life is full of surprises and very few of us get to where we want to go. However those that have a passion for what they do always succeed and pull others along with them. In my mind that is the very essence of a coach, Pia and Lynn are true coaches they have a passion for life and for golf, their words and life experiences will help any level of golfer aspire to be the best they can be." — Dave Phillips, Co-founder Titleist Performance Institute. Pia Nilsson and Lynn Marriott understand athletes, understand competition, and have the unique ability to get the absolute best out of the players on Tour. Having read Every Shot Must Have a Purpose and having seen so many players on the LPGA embrace its principles, I couldn't wait to read Play Your Best Golf Now!" — Michael Whan, LPGA Commissioner. Lynn and Pia inherently believe that every person can maximize their potential. Whether you're the number one player in the world, or a weekend golfer looking to discover your best game, the holistic approach of VISION54 will not only coach you to be better, it will make you love this sport even more." — Cindy L. Davis, President, Nike Golf. As two of the original education consultants for The First Tee, Lynn and Pia were involved in the development of The First Tee's Life Skills Experience curriculum and Coach Program. Without a doubt, The First Tee's youth participants, as well as its coaches, have been positively impacted by using some of the same Essential Playing Skills you will learn about when you read this book. If you want to develop skills that will help you perform better both in golf and in life, then Lynn and Pia have a proven track-record of helping players of all ages, skill levels and walks of life. At The First Tee, we have benefitted from their expertise and so will you!" — Joe Louis Barrow, Jr., Chief Executive Officer, The First Tee. Lynn Marriott and Pia Nilsson have been selflessly sharing their unique insights to the learning and teaching of golf with other PGA Professionals. Their presentations consistently rank high in their content and delivery by the experts in golf instruction." — Joe Steranka, Chief Executive Officer of the PGA of America. Pia Nilsson and Lynn Marriott are not only two of the finest teachers in golf, they are also two of the finest people I know." —Ty M. Votaw, Executive Vice President, PGA TOUR. The insights and lessons of VISION54 extend well beyond the practice range and the golf course: Focus on what you can control; stay in the moment, and revel in the joy of playing. These are very valuable lessons for life!" — Rear Admiral Marty Evans, U.S. Navy (Retired), former CEO of Girl Scouts of the USA and American Red Cross. Play Your Best Golf Now" is the third instruction book from Pia Nilsson and Lynn Marriott. Any golfer with an eye on improving their game needs to own this excellent trilogy." — Barney Adams, founder Adams Golf. Lynn Marriott & Pia Nilsson have helped countless golfers—ranging from those just starting out to the very best in the world— play to their maximum, with their innovative teaching skills. Above that is their sheer passion for the game and for life which is immediately evident the very moment you are in the ladies' company. Let them help YOU!!" — Ken Schofield Executive Director, PGA European Tour 1975-2004. I can think of no better source than Pia and Lynn when it comes to preparation to play the game of golf. Their knowledge and experience certainly qualify them as leaders in their field." — Dana Garmany, Chairman and CEO Troon Golf. All that changes in our very physical being is a reflection of the complex workings of the mind. Pia and Lynn help us channel those workings to make what we do better." — Frank Thomas, USGA Technical Director from 1974-2000 and Founder of Frankly Golf. Having read much of their teachings, our expectations were high but were still far exceeded in person. Their combination of logic, order, intelligence and spirituality is at once irrefutable, confidence inspiring and soothing. We went for help in how to approach golf but like so many things in this great game it turned out to be a lesson in life." — Seth Waugh, CEO Deutsche Bank, Americas. In working with Lynn and Pia I was delighted to experience their mastery at coaching human potential and achieving extraordinary performance in golf and life. Their belief and work with integrating the physical, mental and emotional through intention and practice is a model for the future." — Michael Murphy, author of Golf in the Kingdom and co-founder of the Esalen Institute. If you want to improve your golf game so you can hold your own with thieves, this is the book for you." — Dan Jenkins, award-winning author and Golf Digest columnist. Pia and Lynn have a knack for lasering in on tactics that help golfers get better efficiently, while avoiding those that seem useful but mostly are a waste of time. Their approach isn't the same old, same old. It's fresh, and for those who believe (like me) and are willing to make an honest effort, it really works." — John Paul Newport, golf columnist, The Wall Street Journal. Pia and Lynn are the superstars of golf instruction in the 21st Century. They're not just teaching arm angles and swing planes--their focus is on the total experience. What you achieve is limited in large part by what you believe you can achieve. Pia and Lynn inspire their students to dream big. They remind us that passion and joy are as important to low scores as mechanics. The genius of their VISION54 is that it's compatible with any swing theory. "—Jerry Tarde, Chairman and Editor-In-Chief of Golf Digest. What Pia and Lynn do so well is tap into the golfer who resides in all of us - the player who is in the moment, peaceful, trusting and accepting. In many ways, they teach us how to be our own best friend on the golf course. Even better, the skills can be applied to any aspect of life." — Damon Hack, Sports Illustrated senior golf and NFL writer. The positive vibe of Lynn Marriott and Pia Nilsson is palpable, whether face to face or in the words of their books. If you want to feed off the basic principles that made Annika Sorenstam the best mind in the women's game, if you want to start smiling on the golf course again, then let Lynn and Pia set you free. You may not have the game to shoot 54, but their latest book will give you the vision to break 64, 74, 84, 94, 104 or whatever your threshold." — Tim Rosaforte, Senior Writer Golf World, analyst for Golf Channel and NBC. If you know golfers who think they've tried it all and nothing works, give them one of Pia and Lynn's books. They'll discover new ways to get better. Pia and Lynn look at all of the golfer's opportunities to improve, not at creating the so-called perfect swing. And they make it fun." — Peter Morrice, Senior Editor, Golf Digest. Several LPGA players have met with a VISION54 instructor for the first time on a Tuesday and by Sunday, they're hoisting a trophy. That kind of result gets attention. Yet, no one on tour is a better walking billboard for the Vision54 program than Ai Miyazato, who credits her five victories in 2010 to a complete mental turnaround. Ai's father, her only instructor, attended a preseason session with Pia and Lynn in Phoenix and said their techniques enabled Ai to rid her body of tension and swing naturally. She rose to No. 1 in the world." — Beth Ann Baldry, Senior writer, Golfweek Magazine. What I think matters most to good players and others, is Pia and Lynn's ability to make you really like the game and the challenges again. Some have a continuing love affair, but not everyone." — Judy Rankin, World Golf Hall of Fame Member and TV analyst. Pia and Lynn are revolutionaries in the complex, over-analyzed world of golf instruction. They have the unique ability to provide individualized instruction based on the needs, strengths, and weaknesses of the student. They have helped transform my game, and more importantly my life to best support my passionate pursuit of my dreams and aspirations on the global golf stage. 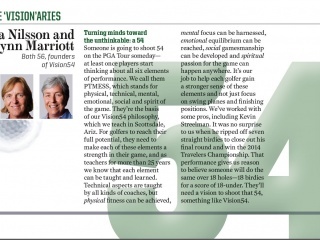 VISION54 is the best golf/sport/life/happiness program ever developed, bar none!" — Kevin Streelman, PGA Tour Player. Lynn and Pia have helped me learn how to more fully realize the joy and passion I have for the game of the golf. They have shown me that magic is possible and that the only limit to what I can achieve on the golf course is my beliefs. If you believe in greatness you can make greatness happen." — Ai Miyazato, LPGA Tour player. "Pia and Lynn have helped me understand how I get the best out of myself and to better understand the game of golf. Through their coaching I have got to know myself better, know what to do to not get in my own way and allowing myself to dream!" — Suzann Pettersen, LPGA Tour player. We share the same vision - that it's possible to birdie every hole and shoot 54, and that there are no limits to what you can achieve. In many ways, I am the embodiment of the VISION54 coaching philosophies." — Annika Sorenstam, LPGA Superstar. Pia and Lynn's simple approaches make me mentally a stronger player." — Yani Tseng, LPGA Tour Player. The week I started working with Lynn and Pia, I won! Their coaching has made my game more complete." — Na Yeon Choi, LPGA Tour Player. I thought I knew it all. I was wrong. I began with the smallest changes, and they made the biggest difference in my golf game and in my life; Thanks to Lynn and Pia, I fell in love with golf again." — Grace Park, LPGA Tour Player. Pia, Lynn and their staff have been instrumental in my success in the past two years. Their insight into the golf game and the mind is second to none. I have reaped rewards from incorporating their techniques in the past and look forward to learning more in the future. It was well documented that when I won the Kraft event that I was utilizing their techniques to remain calm and focused. I have confidence that Pia and Lynn will help you as much as they have helped me. Enjoy this book!" — Brittany Lincicome, LPGA Tour Player. Pia and Lynn have set a new standard in mental coaching. It's amazing how they can pick up on the little things, tell me to try something different, and it actually works. When I work with them, everything seems to have a simple solution. I feel very fortunate to have been able to work with them." — Sophie Gustafson, LPGA Tour player. VISION54 is a phenomenal concept, it's message is simple yet often overlooked, the fact that you can accomplish and do anything, the possibilities are endless and limitless. 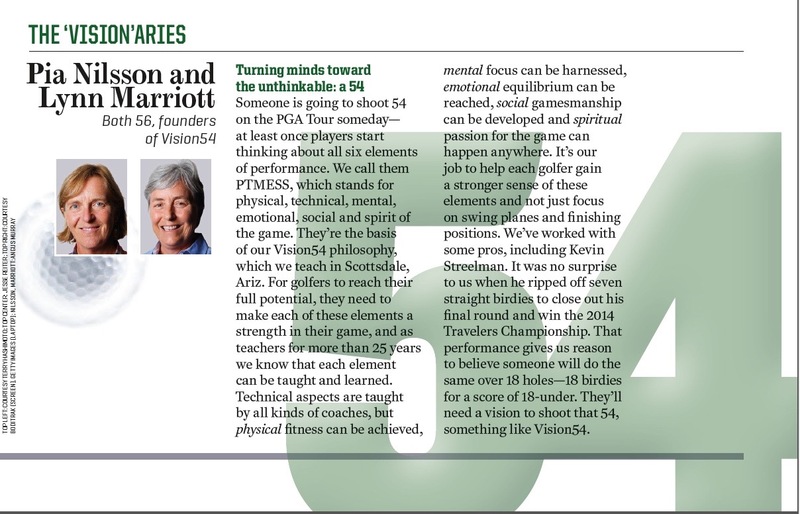 The concept of VISION54 is such a refreshing outlook on golf and life. Pia and Lynn are the most positive people I know, and the energy that they exude is amazing, they make you want to be better." — Brittany Lang, LPGA Tour player. Pia and Lynn has helped me to get my focus specific, given me tools to enjoy learning in everyday practice, given me wings to dream big, supported me to experience things with my heart and helped me to get my own spirit of the game stronger." — Minea Blomqvist, LPGA Tour player. 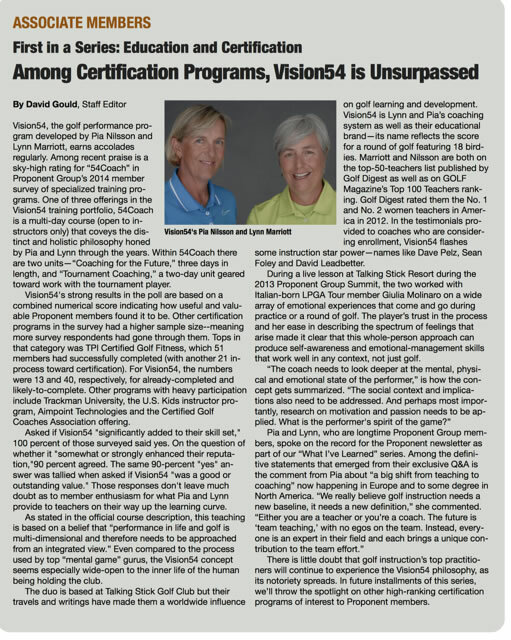 When it comes to improving your game, Lynn and Pia and all the experts at VISION54, are the real deal. Coaching golfers to reach their best, takes a lot more than knowing how to swing a club. Their techniques are simple, effective and proven with all levels of players. Do yourself and you game a favor and read this book." — Dr. Greg Rose, Co-founder Titleist Performance Institute. Lynn and Pia are highly respected, nationally and internationally recognized leaders in the golf teaching and coaching profession. They are second to none and have a long and impressive track record of effectively helping their students learn to realize their full potential as players at both amateur and professional levels. They have complete command of the essential knowledge and skills that are needed to learn to play the game effectively and very insightful and meaningful ways of communicating that information to their students. Indeed, their teaching, coaching, VISION54 program and two previous books are all on the cutting edge just as their new book (Play Your Best Golf Now) promises to be." — Dr. Bob Christina, Emeritus Dean & Professor, University of North Carolina at Greensboro. Whenever I see a player making rapid progress on a professional tour, I wonder if they are being coached by Nilsson and Marriott. I have been surprised to discover how often this is the case. Lynn and Pia clearly have an approach that is both unique and powerful. In "Play your Best Golf Now" they share more of their insights and practices that can make every golfer a better player." — Dr. Paul G. Schempp, Director, Sport Instruction Research Lab, University of Georgia. Lynn and Pia and their VISION54 have developed a most unique program. Whether you attend their clinics or read their books, you know you are learning more than golf; you are learning skills that you can apply in all areas of your life. Golf is just the vehicle they use to teach the skills. All you need to do is to step back and make sure you see the big picture that they are helping you create." — Steven J. Danish, PhD. Director, Life Skills Center and F.R.E.E 4 Vets Program, Professor of Psychology and Social and Behavioral Health.